This round's overall winner is James Jacobs. Please check your final score. It was cool to see a "homebrew" Space Mission backstory; thanks for writing that background! Even a very short story makes a nice addition to the game. I'm not happy with how points were awarded for time and score this round. The scoring system is the best thing that I could come up with for this game. This game is too short, which is a shame, as there seems to be so much lost potential here! The main game for Round 4 of Arcadia 2001/MPT-03 High Score Club is Missile War, a game similar to Missile Command. Due to events beyond my control, the next round is delayed for about a month. I'll try to start round 4 up at the end of March. Thanks for playing in round 3 and please stay tuned here for the announcement of round 4. The HSC is not dead, but it must be put on a back burner for now. Yes, they do look similar, but only in passing. Cockpit views seem to have been around forever. I do love Odyssey 2 boxes. They have the best artwork on nearly any console (past to present). There is something almost magical about it. Perhaps there really is some magic in there-- thanks Odyssey 2 Wizard! It's got the same pilot's hands in the same positions (and the same circles and squares running down the panels around and between them), the three levers to the left (although the handles are different), the grid of blinky lights and radar screen (cut off by right border) to the right, the same window struts (except the Arcadia version adds two support struts and removes the central display screen, the same streaking comet or laser fire things in essentially the same positions, even the general shape of the UFO is the same (sort of a bell-looking thing). No, it's clear. In addition to Star Wars, the Arcadia artist(s?) 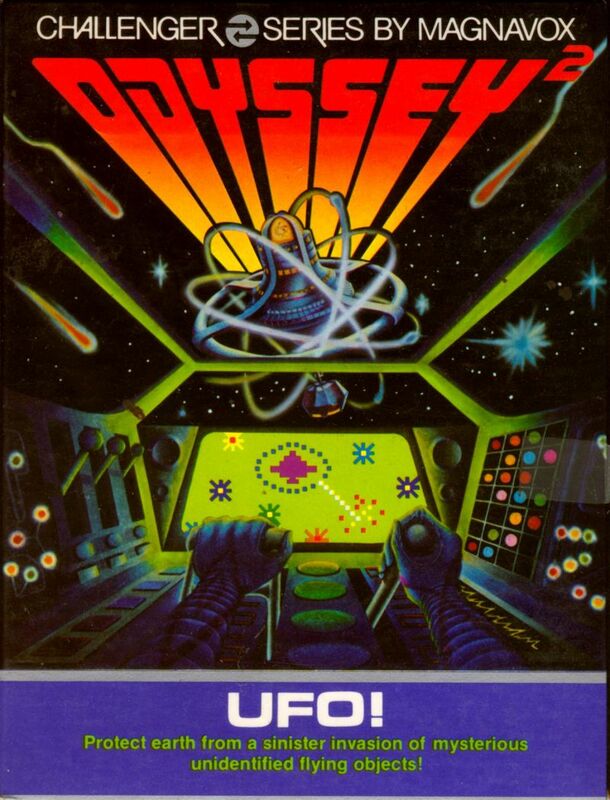 was also not above flat-out ripping off Odyssey 2 artwork.